NEW ORLEANS – For the first time since 2011, one program has three men on The Bowerman Award Watch List and has everybody else looking through maroon-tinted glasses. If you can’t tell from the context clues, that program is Texas A&M – the 2017 NCAA Division I Indoor Track & Field champions. The Aggies join Florida as the only other team in the history of The Bowerman Award Watch List to have three men honored (The Gators did it 7 times in 2011 with Will Claye, Jeff Demps and Christian Taylor). Fred Kerley, Ioannis Kyriazis and Lindon Victor are three of the 10 men on the Mid-Outdoor version of The Bowerman Award Watch List, which was released Thursday by the U.S. Track & Field and Cross Country Coaches Association (USTFCCCA). Grant Holloway FR Florida Hurdles/Jumps Chesapeake, Va.
Also Receiving Votes: Emmanuel Korir (UTEP), Devon Williams (Georgia). Those three Aggies join two Gators (KeAndre Bates and Grant Holloway), one Duck (Edward Cheserek), one Volunteer (Christian Coleman), one Ram (Mostafa Hassan), one Coyote (Chris Nilsen) and for the first time in program history, one Lobo (Josh Kerr). Kerley already put the collegiate track & field world on notice during the indoor season but little was seen of Kyriazis or Victor. While Kyriazis specializes in the javelin throw, Victor struggled in the heptathlon at the NCAA Indoor Championships and needed to bounce back in a big way. Victor did just that at the 90th Clyde Littlefield Texas Relays when he broke Trey Hardee’s near 11-year-old collegiate decathlon record. The Texas A&M senior totaled 8472 points and posted outdoor PRs in the long jump, shot put, high jump and 400. Kryiazis had himself a day in Austin, too. The native of Athens, Greece, launched the javelin farther than all but one man in collegiate history. Kryiazis’ heave of 88.01m (288-9) came on his 1st attempt and was 3 feet, 7 inches shy of Patrik Boden’s collegiate record set in 1990. Kerr landed on the Watch List after riding the wave of success from a breakout indoor season. The Scotsman upset Cheserek to win the NCAA mile title and debuted outdoors in the 1500 at the Bryan Clay Invitational. Kerr rolled to a victory in Azusa, California, and posted the 6th fastest time in collegiate history over 1500 meters (3:35.99). Speaking of Cheserek, he was entered in the 1500 at the Bryan Clay Invitational but scratched. Cheserek made his outdoor debut at the Stanford Invitational last month, winning his section of the 10000 in 28:46.48, which is good enough for 11th on the NCAA DI Descending Order List. Coleman only has one open 100 under his belt this season so far, which came at the Tennessee Relays two weeks ago. The two-time 2017 NCAA champ ran 10.03 into a headwind. Bates used a strong tailwind this past weekend to post the 2nd best mark of the season in the long jump (8.13m/26-8¼) and won the triple jump at the Florida Relays earlier this season with an effort of 16.31m (53-6¼). Holloway competed three times in a span of an hour this past weekend at the Horned Frog Invitational and notched a pair of top-3 marks in his signature events (110 hurdles (13.51w) and long jump (8.04m/26-4½)), but it’s what he did at the Florida Relays that had everybody talking. The freshman phenom unofficially split 44.1 on the anchor leg of the 4×400 and blew the doors off the competition to give the Gators the comeback win. Hassan picked up where he left off during the indoor season and is currently lapping the nation in the shot put. The native of Cairo, Egypt, owns an NCAA-leading mark of 21.31m (69-11) – which set a PR and won the Mt. SAC Relays – and is more than 3 feet clear of 2nd place on the NCAA DI Descending Order List. Nilsen has vaulted five times this outdoor season and has four wins under his belt. The freshman matched his lifetime PR of 5.70m (18-8¼) twice and is tied for the NCAA lead. UTEP’s Emmanuel Korir and Georgia’s Devon Williams received votes from The Bowerman Award Watch List Committee, but not enough to land on the actual Watch List. 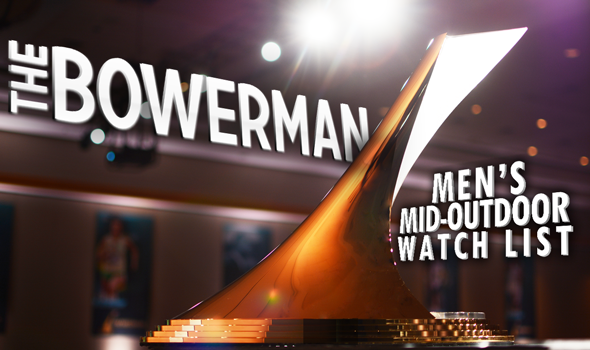 The next edition of The Bowerman Award Watch List comes out May 4.